Yesterday Baltimore Bike Share, a program of the City of Baltimore’s Department of Transportation announced that it will be taking the system offline from September 17-October 15 to address a security retrofit, maintenance backlog, and other enhancements in advance of expansion this fall. Anyone trying to use bike share these past few months noticed how the system was failing. Empty stations became the norm. Many who had just begun to rely on bike share for their commute were suddenly faced with having to make other arrangements. Contributing to the challenges of bike share operations was a rash of theft and vandalism that operators first became aware of late spring. As city staff and the bike share operator Bewegen began working on a solution, the system itself chose not to make any external communication regarding the system challenges. It’s a perplexing public relations move in this age of transparency — where information is readily available. For that the City and Baltimore Bike Share deserve criticism. But in the wake of the formal announcement, we wanted to share with you some of the facts related to the reboot. Our stance on bike share is clear. It can work. Yes, even in Baltimore. When the bikes were available, our system succeeded on metrics related to miles traveled and ridership. Where it has fallen short is it’s inability to rapidly expand — meaning fewer neighborhoods get to experience the convenience of bike share — and not capitalizing on bike share’s greatest asset. It’s really fun! Why does the marketing and communications about the largest fleet of electric bike share bicycles in the Western Hemisphere feel out of touch and out of date? Like it’s actually a bike share company communicating with us from the year 2005? But there is even good news to share on this topic. Last month, Bewegen hired a new marketing advisor for their U.S. market. Chris King has a lot of experience marketing transportation brands in the mid atlantic. And while Baltimore Bike Share has a long road ahead earning back the trust of its users, we are encouraged Bewegen recognized this shortcoming and took steps to correct course. So in the spirit of transparency and clear communication here is a quick FAQ we put together based on some of the online chatter we saw in response to the announcement. When will the bikes go offline? What sort of maintenance and upgrades will occur during that time? Why is Baltimore experiencing so much theft and vandalism? Haven’t other cities figured this out? Loss is expected in systems like this. It’s planned for by implementing loss prevention techniques like locks and GPS, and insuring the bikes. Much is done to prevent it, but it is never fully avoidable. Other cities experience theft, but at a lower rate and within larger systems where the loss is less noticeable. The challenge with a system like this in Baltimore is that crime is more prevalent here, and it would be naive to ignore that fact. Very few bikes have been totally lost, but when they are recovered they face extensive repairs—tying up maintenance staff and creating a serious bottleneck, reducing the number of bikes available to rent. What’s encouraging is that the folks involved in addressing this issue recognize that locks are not enough. So while a technical fix is in place to improve loss prevention, we’ve been encouraged by conversations with Bewegen this week that demonstrate they are exploring ways to creatively prevent and intervene when crimes like this occur. They know that making bike share more accessible and inclusive must be part of the strategy. Why didn’t we use better locks, or a proven operator? Despite Bewegen being a newer company, they are not new to bikeshare. The engineers and business leaders were involved in creating and founding the very first bike share systems under the Canadian company Bixi. The locks on the stations in Baltimore are nearly identical to ones in bike share docks across the country. That said, each company has to develop it’s own proprietary equipment--something typical in a small market. In the face of this challenge, Bewegen has stepped up and taken responsibility for this shortcoming and is bearing the cost for the research, design, and installation of the new locking system. Additionally Bewegen has provided extra maintenance staff, and is extending the warranty on bikes that were vandalized. It’s not ideal, but Bewegen has demonstrated itself to be a company of high integrity, committed to making this work in Baltimore. The City, and most importantly taxpayers are not on the hook for these challenges. Why didn’t Baltimore Bike Share communicate earlier? We don’t know. We advocated for it. Strongly. But communication out of DOT has always been a challenge. Transparency is not our City’s strong suit. But other stakeholders are ready to fill the void, and we believe that this was a learning moment for Bewegen and one they have actively addressed by hiring someone local in Baltimore to manage marketing and communications for US markets moving forward. Is the membership extension only for founding members? Can I get a refund? While the specific details of compensation haven’t been disclosed from Bewegen, what we have heard presently is that anyone that has ever purchased a month membership will receive a free month. Anyone that purchased an annual membership will be compensated at an extended rate — which we expect to be anywhere from 6 months to a year. They plan on communicating the specifics very shortly, so members should watch their email for specifics. Does Bikemore think Bike Share can work in Baltimore? The City has to be bike share’s biggest cheerleader. We would love to see Mayor Pugh riding a bike share bike at the October relaunch. Bike share is healthy, fun, and affordable — and should be something the city works hard to expand and get right. We have to figure out the public/private partnership. Sponsors haven’t been clamoring to get on board. And following this setback, it may prove even more difficult to get corporate sponsors interested. The City needs to evaluate the plan and process for securing sponsors, and perhaps find ways to improve the system and expand through other means. Allow bike share a solid 12 months of success, and it will be much easier to ask someone to attach their brand to the system. Additionally, if bike share is to operate as public transportation the City must explore ways to fund with public dollars. Allowing the private market to solely dictate expansion rates and station locations will only further the inequity. Is there a way to allocate revenue from things like the parking tax or traffic citations to fund transportation improvements city wide? We want to see City Council and the Mayor’s office exploring these options. Do more to make bike share for everybody. The Downtown Partnership’s subsidized membership program is good, but how is it being communicated? How easy is it to obtain? Getting equity right on bike share is a challenge that every city is confronting. No one has gotten it right yet, but many are headed in the right direction. We have to be one of those cities. We have to be willing to lead and be visionary in this area. Mobility isn’t something to be taken lightly. In no way is bike share a panacea in addressing Baltimore’s transportation inequities. But it most certainly should not exacerbate the inequity. This month Bike Share is coming to Baltimore! Bringing Bike Share to Charm City has been a major priority of Bikemore since our inception. 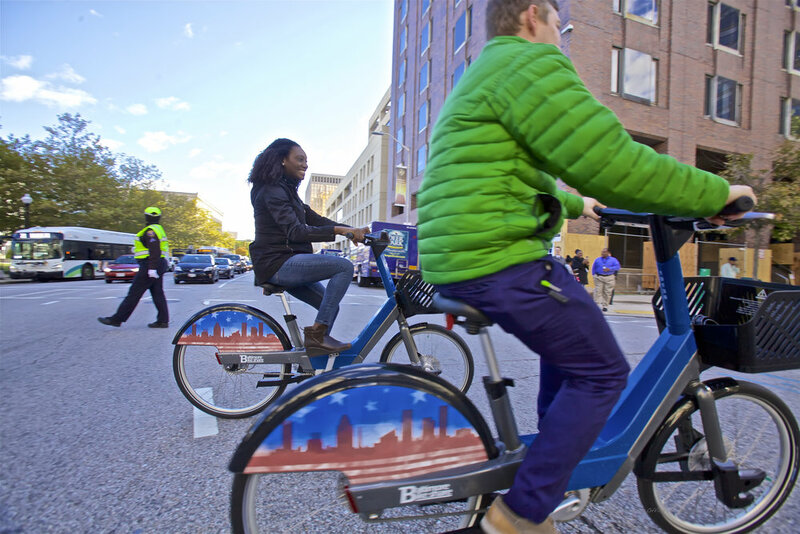 With the launch day just around the corner (we’re keeping mum on the date until we get the go ahead from the City), we wanted to share some facts about the system and why Bike Share is critical in making Baltimore a bicycling city. 1. Buy a Founding Membership, like RIGHT NOW! Baltimore Bike Share is offering THE BEST deal for folks willing to be early adopters. They are selling 250 founding memberships. For $100 you lock in the annual price for life — saving tons of money on a monthly regularly priced membership, currently $15/month. The membership kicks in as soon as Bike Share launches. And it comes with a free Zipcar membership for the current year and each year that you renew your Bike Share membership. When you receive your pass in the mail, it will include instructions on how to activate your Zipcar membership. Already a Zipcar member? Your package will include $35 of driving credit. 2. Phase one launch will mean 50 stations and nearly 500 bikes on the ground by Spring 2017. The initial footprint of Bike Share covers neighborhoods in Southwest, South, Southeast and Downtown Baltimore. Carroll Park, Druid Hill Park, and Patterson Park will all have stations to ensure that those new to biking or those that wish to use biking for recreation will have access to stations in close proximity to trails. Station location was determined by weighing a variety of factors. Density — In order for bike share to be convenient and encourage use, stations must be close together. As NACTO has learned from bike share systems in many other cities, “stations a five minute walk apart provide more convenient, reliable service and are used much more frequently than systems with more far-flung stations.” Baltimore Bike Share has made a conscious decision to start with a dense system over a smaller area to ensure the bikes on the ground are used regularly. As more resources become available, the system will build out and eventually reach all neighborhoods in Baltimore City. Logistics and Cost — In order for stations to operate, there are certain space and infrastructure requirements at each station site. Finding locations that met the required density, but also had access to electrical conduit that would not require major construction to access was key in conserving resources. Other constraints include conforming to existing right of way requirements and ensuring that stations do not block pedestrian access. Sponsorship also plays a role. Given the city’s constrained financial resources for the project — if a public or private entity comes to the table willing to sponsor a station, that does influence station location. For example, many of the Phase I stations are being sited at MTA Transit hubs to assist with first and last mile connectivity. MTA is the sponsor for those stations and assumes the cost. Equity — While bike share, given its limited scope and size, cannot and should not be viewed as a panacea to solve Baltimore’s gross transportation inequities, it was important to everyone in Baltimore that thoughtful consideration was given to how to provide access to the system. One part of access is having stations visible in your neighborhood. Bikemore worked with the City to champion both a short term and long term vision for station siting that will make Baltimore Bike Share inclusive and accessible for all residents that wish to participate. 3. Who can ride bike share? Bike Share is available to any adult age 18 and up. There are not currently any options for transporting kids with Bike Share or for kids to ride them. And going up hills will be super easy, because half of the bikes (the ones identified with a white lightning bolt on the back fender) have an electric pedal-assist that automatically kicks in. We'll have the largest electric bike share fleet in the Western Hemisphere! 4. What steps are being made to make is accessible to those without a bank account? One of the ways to Bike Share is working to be ensure access is by accepting cash payments for monthly memberships. To pay with cash, you’ll call Bike Share to register. The pass will be mailed to you along with instructions to go to a particular location to pay. After paying, your pass will be activated for the next 30 days. 5. Will Bike Share be compatible with other systems? While Baltimore Bike Share won’t be compatible with Capital Bike Share in DC (but constantly evolving technology doesn’t rule it out entirely in the future), conversations and technology is being developed so that it does become compatible with Maryland Public Transit. This means you could use your Charm Card to rent a bike — improving equity and accessibility. This is a service that will most likely be available in late 2017. 6. Who picked the bike design? The bike design was selected by city staff. The purpose was to select something that would provide a blank slate so that once a title sponsor is secured, the bike design could be swapped out to reflect the sponsorship. Identifying sponsors who want to use the bikes and kiosks for advertising is a key component of Bike Share’s financial sustainability. Sponsorships conversations are underway and many station sponsors have already been identified. It’s quite common for systems to launch without a title sponsor and acquire them once the community responds positively to the new system. 7. Why does Bikemore love Bike Share? Riding a Bike Share bike doesn’t require much planning, or a special outfit. When cities adopt bike share into their transportation network, they take a giant leap to make biking a normal, everyday activity for residents. That makes biking safer and cities healthier. A robust Bike Share system is critical to improving mobility and access to active transportation for Baltimore’s residents. Convinced that Bike Share is a great way to get around? Visit www.bmorebikeshare.com to sign up! Bike Share is Coming to Baltimore! Good things come to those who wait. After six years of lessons learned and a few false starts, today the city approved Bewegen (Be-Wee-Gen, hard "g") as the City's official bike share vendor. The system, which is set to launch in Fall 2016, will include in it's initial phase 50 stations and 500 bikes, 200 of which will be Pedelec bikes making it the largest fleet of pedal assist bikes in North and South America. The bikes, which we got to test ride today, are some of the lightest bike share bikes on the market. The non-pedal assist bikes feature eight gears. Both bikes feature a front basket that can hold up to 55 pounds. Both bikes feature a skirt guard, front fender, enclosed drivetrain, front and rear lights, and a digital display and speaker. The Pedelec bikes feature a battery that can operate autonomously for one day (60 miles, or 24 hours) on a single one hour charge. The stations are fully modular. The City purchased 5 solar canopy stations. Stations can also be quickly configured using geofence technology--creating flexibility to create additional stations to coincide with special events (think O's games or Artscape). The stations automatically lock the bike once docked, and have an option to lock the bike using an integrated cable lock if the station is full. The system also allows you to temporarily lock the bike outside of the system to help accommodate quick errands. But similarly to how Zipcar works, in that only the member with that car reserved can unlock the vehicle, new riders can only unlock bikes from official docking stations or kiosks, and the member using that bike can only lock or unlock it outside the docks. Station locations have not been finalized. Bewegen will work closely with the City and Bikemore to engage in a thorough and equitable community engagement process to ensure citizens needs are considered. We can say with confidence though, that given the size of the initial launch and the need for the system to remain densely sited, it's impossible for every Baltimore neighborhood to receive a station during Phase One. Bikemore will be advocating for priority areas that balance the need for bike share to serve as a transportation option--connecting our downtown work centers to surrounding neighborhoods, and providing equitable access to bike share as a viable recreation option in places like Druid Hill Park and Lake Montebello. Removing barriers to bicycling begins with providing access to biking as a form of recreation. Membership pricing has not yet been determined. We do know however, that bikes will be available for check out using a credit card at kiosk for daily rentals and RFID key similar to Capitol Bike Share or a cash membership option for the unbanked for monthly or annual members. One of the most exciting payment options includes integration with the Charm Card transit pass, and the ability to check out the bike using a mobile phone app. It's important to note that integration with Capital Bike Share in DC was not part of the initial contract, but the barriers to integration have more to do with coordinating each jurisdiction, and less to do with technology. Bewegen is confident that the technology available on their bikes leaves the door open to integrating with Capital Bike Share down the line. We will continue to advocate for this integration with Capital Bike Share and look forward to beginning discussions with our partners in DC. One of the best things bike share does is normalize every day bike riding. We know the number one way to improve the safety of people who bike, is to increase the number of people who ride. Bike share programs do this incredibly well, providing a comfortable, stable upright riding experience--without having to think through some of the barriers to bike riding: where will I lock up, where will I store my bike in my home, what if I want to ride to a location but take transit back, etc. Bike share also has the ability to dramatically improve first and last mile solutions for transit riders. In a city with a challenged public transportation system, bike share also has the ability to limit transfers, improving the on time reliability of transit. But given the challenges the City has faced upon launch, and the many years the naysayers have had to develop their gripes, the politics of launching bike share presents a real challenge. One of the most exciting parts of the contract includes Bewegen locating their North American headquarters in Baltimore, creating approximately 80 new local jobs. Already having launched a successful program in Birmingham, AL, and set to launch Richmond, VA ahead of Baltimore, Bewegen and their pedal assist bike share systems are positioned for growth. Having their headquarters in Baltimore has the real potential to put us on the map as innovators in how bicycles integrate into urban life. Also, we were impressed at the City's ability to turn a $2.3 million dollar contract into 80 local jobs, solidifying the fact that bikes truly mean business. It's also really important that our members have all the facts available to them, so that they can truly be the new system's best ambassadors. That is why we are partnering with BCDOT to provide a bike share open house where Bikemore members will have a chance to test ride the bike share bikes and ask questions of city staff. Stay tuned for our announcement of the date and time of that event. We expect to host it sometime in April or May. The community engagement process to answer questions and determine specifics of operation including station siting and membership rates is just beginning. Bikemore is committed to leading this effort in partnership with the City so that an inclusive, successful system of bike share in Baltimore is achieved. We are currently soliciting funds to help this effort. If you or your organization would like to support us please donate here, or contact Liz Cornish, liz@bikemore.net to learn more.